For centuries the Death Knight had enviously watched the living. Their joys, their freedom, even the fact that they grew old fed his rage, and only in executing those innocent souls did his rage find relief. Now, at last, the time for vengeance had come. The Undead army was mustering, and he was in its vanguard, ready to charge forward and slash the throat of every living creature in the army’s path. The Undead army has been gathering strength for generations. No one alive now remembers when the cruel curse of Undead existence first fell upon these soldiers. No one can recall a time when there were not vague rumors of Wraiths stealing farmers’ souls, or Skeleton Archers firing plague-smeared arrows into villagers’ homes. Now, the Undead army is on the march, intent on unleashing plague, destruction, and doom deep in the heart of Terrinoth. 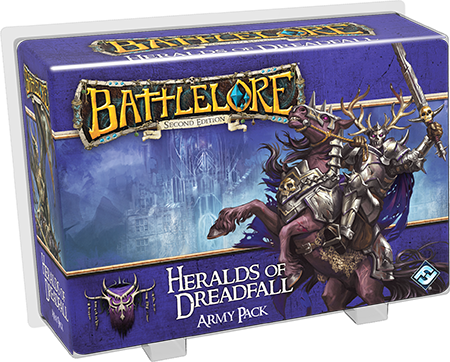 Heralds of Dreadfall is one of two Army Packs bringing the Undead faction to the game of BattleLore Second Edition. 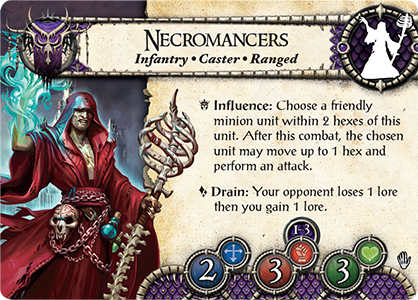 Like Terrors of the Mists, it features five different types of units, a complete lore deck and everything you need to lead a menacing army of Undead into battle. 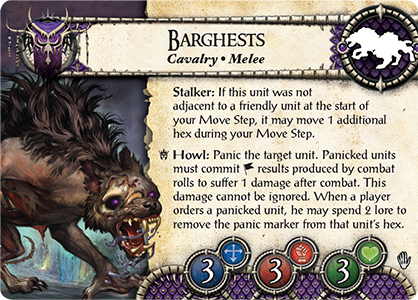 Today’s preview introduces the forces of Heralds of Dreadfall, from shambling infantry to a monstrous dragon, all hungry to inflict merciless vengeance upon the living. In the front lines of the Undead army are those soldiers who have served in it the longest, deathless and insatiable souls eager for war. Hordes of armoured, skeletal Infantry known as Reanimates spearhead the Undead invasion. The strength of these footsoldiers is in thier numbers– for every figure in the unit, a die is added to each combat roll. They are also virtually indestructable, being able to regenerate with a result. 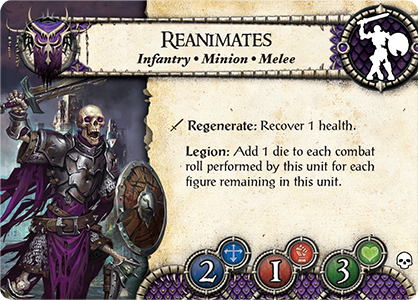 Reanimates are composed of the essence of the first, cursed Undead soldiers who now occupy more recently dead human forms. The mounted Death Knights that charge forward beside them, however, still occupy the form they had when they first became cursed centuries ago. The terrible strength that these knights possess translates to an Unholy Might on the battlefield that prevents them from being attacked by weak enemy units. 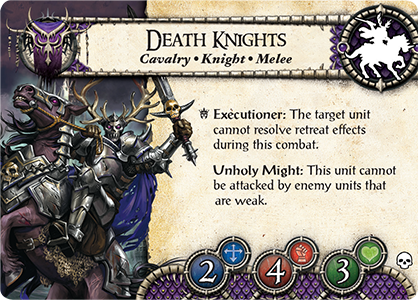 A unit of Death Kngihts rolls four dice in combat – more than any other Cavalry unit in BattleLore. 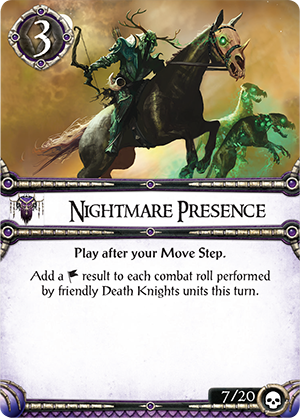 By playing the Nightmare Presence lore card you can make these murderous warriors even more daunting, and add a to every combat roll they perform in a turn. As the heralds and vanguard of your Undead army, Reanimates and Death Knights will be the first units to encounter enemy troops. 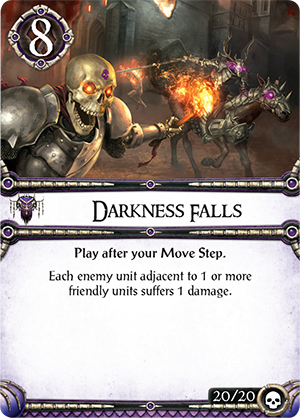 The Darkness Falls lore card rewards you for sending these troops deep into your opponent’s territory. Played after a move step, it deals one point of damage to all enemy units adjacent to your forces. Such is the power of the Undead: mortals are wounded by the mere sight of them. Wraiths are spirits so powerful that they do not need corporeal form in order to fight. How exactly a Wraith comes into being is unknown, though the cruel deaths that the Undead inflict on their victims have a tendency to create these foul spirits. Wraiths move more quickly than Reanimates or even Death Knights, with a movement value of three and the ability to move through occupied hexes. Lacking bodies, Wraiths are challenging for enemies to fight without using magic: Non-caster units roll one less die against them in combat. 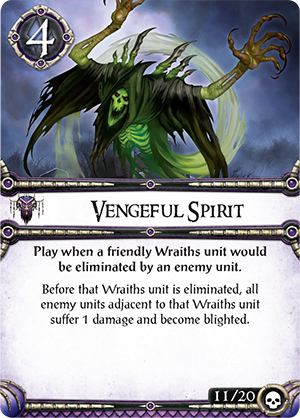 Should an enemy prove able to defeat a Wraiths unit, as they perish the Wraiths themselves will take revenge: play the Vengeful Spirits lore card at that moment to damage all enemy units adjacent to the dissipating Wraiths. Wraiths may also take possession of mortal forms by force. 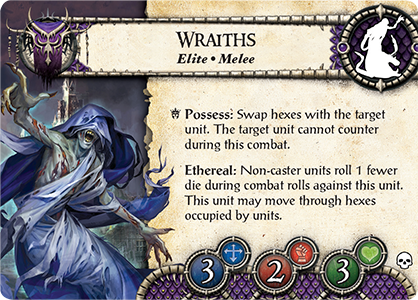 With a result, a Wraiths unit swaps hexes with the target unit. For the rest of the combat, the target unit cannot counter, since they have lost control of their own bodies. 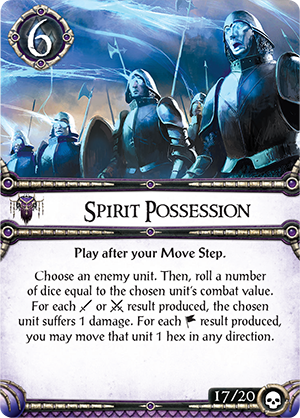 The Spirit Possession lore card has a similar effect, but allows you to damage the enemies that your Undead spirits possess or move them in any direction, regardless of their commander's desire. Not even the Uthuk Y’llan have access to such a diabolical power as possession. 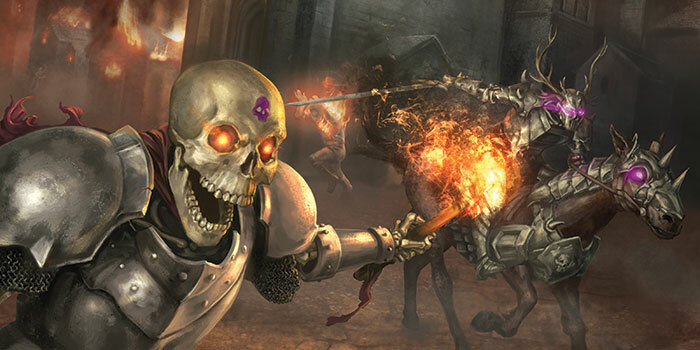 The Undead of Heralds of Dreadfall bring more weapons to the battlefield than swords and fear. The deadliest one in their arsenal may be the plague and its ability to Blight the enemy. 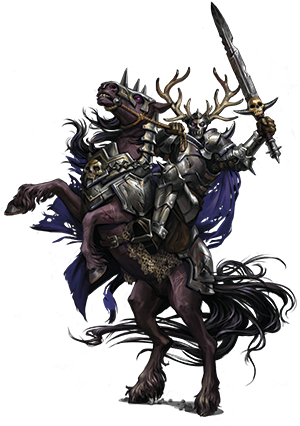 Blighted units have a reduced movement value and, no matter their actual strength, are considered weak. 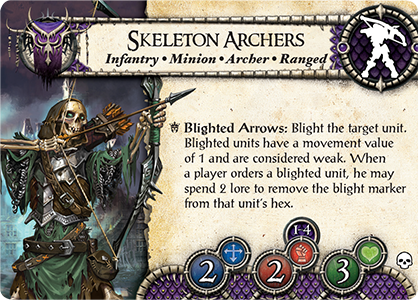 The Skeleton Archers ’ Blighted Arrows provide one way to spread plague among your foes. 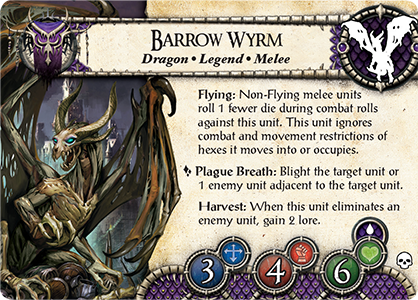 The soaring Barrow Wyrm breathes plague, and with a result can infect either its target or an adjacent enemy unit. These shrewd beasts are created from the husks of dead dragons to fight in the Undead army, and they do so quite happily, relishing the pain they inflict on their enemies and reaping the lore of those they have slain. You may also transform a hex on the battlefield into a lethal and infested bog with the plaguelands terrain tile. Not only are enemy units in the plaguelands considered weak, but an Undead unit fighting from within the plaguelands may commit any number of results to cause one damage each, even if the unit is ordinarily Ranged. 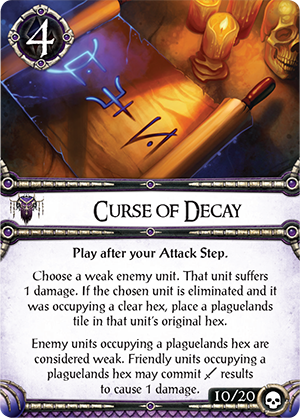 The Curse of Decay lore card enables you to damage a weakened enemy unit, possibly eliminating it and turning the spot where it died into noxious ground. 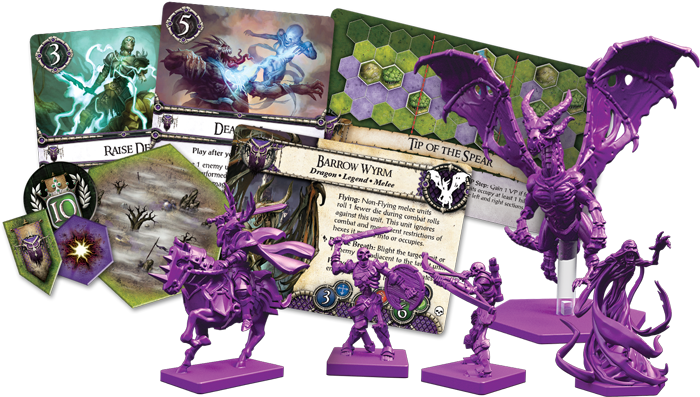 With the units of Heralds of Dreadfall alone, you can muster a variety of armies, each with a unique strategic focus: speed, sheer combat might, plague, possession, and more. Or, you can use one of the included Army Cards to instantly deploy a swift force composed entirely of Infantry and Cavalry, or a multifaceted force capable of countless tactical moves. United with the units of Terrors of the Mists, your possibilities multiply. 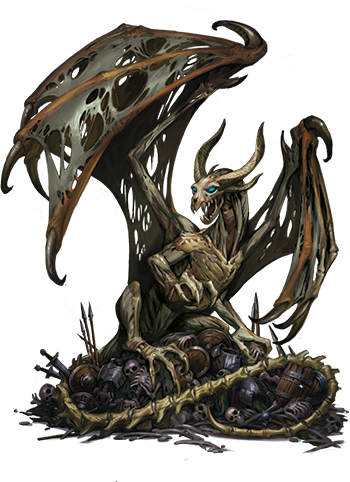 You might incorporate a Necromancer whose powers can make your Reanimates and Skeleton Archers more mobile, or a pack of Barghests to prey upon units that the Barrow Wyrm weakened or comeplled to retreat. No matter what Undead army you muster, you have fear on your side. The moment that living souls dreaded is almost here. The Undead are coming, doom is at hand, and the game of BattleLore Second Edition is about to change. Pre-order Heralds of Dreadfall and Terrors of the Mists from your local retailer today!